Configure an http or https proxy for expediting package downloads by way of caching, or for an environment where DataStax Enterprise clusters must be isolated offline from the internet. The package proxy is disabled by default. Enable the package proxy in Lifecycle Manager if your organization manages your own http or https caching proxy such as Squid. 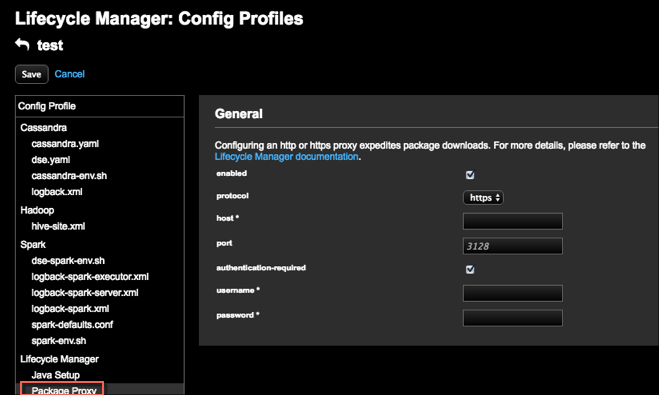 In the Config Profile pane under the Lifecycle Manager section, click Package Proxy. The general settings for configuring package proxy appears. Select enabled for package proxy. Select the http protocol that target nodes use to connect to the proxy. Required: Enter the host, which is the IP address (recommended) or host name of the proxy itself. Enter the port number that the proxy is listening on if it is not the default port. Select whether authentication (above and beyond the DataStax or internal repo authentication) to the proxy itself is required to forward requests, and enter the required username and password. The only type of supported authentication is HTTP Basic Authentication. Be sure to enable Use Configured HTTP Proxy for the appropriate repository.